The back development is very important, everybody wants to have big and powerful back and complete V-shape look. But to have a really great back you don’t need only width you need a lot of thickness to make your back look really impressive. 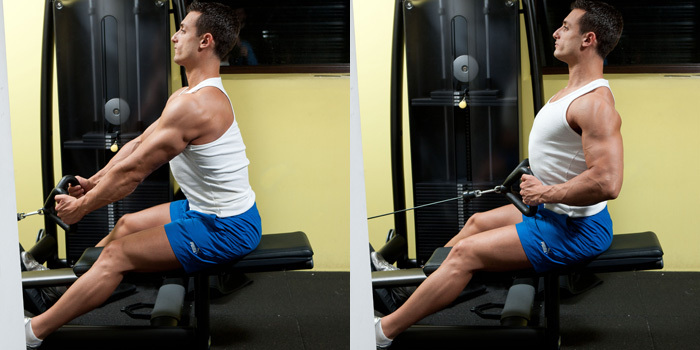 The seated cable rows are one of the best back exercises that can help you to add thickness to your middle back. The cable provides a constant tension for the back muscles in the whole range of motion of the movement and gives you great peak contraction. You can use the seated cable rows in the middle of your back workout or like a finishing exercise after the heavy free weight movements. First attach the close grip bar to a low pulley cable row machine. Sit at the end of the bench or seat and grasp the bar with a neutral grip (palms facing in). Than place your feet on the feet platform and push yourself backward as you maintain a straight back and your arms extended until your knees are slightly flexed and your torso forms a 90 degree angle with your legs. You should be sitting with a slightly arched back, chest sticking out and your hands extended in front your lower abdominals. Breathe in and begin to pull the handle by squeezing your shoulders blades backward and than pull the handle with your arms toward your lower abdominals. When you touch them try to contract all the back muscles and squeeze your shoulder blades together for a second as you breathe out. Go all the way back as you controlled the weight and begin the next repetition. Keep your upper body straight and don’t lean forward or backward during the movement. Keep your elbows as close to your body is possible and don’t let them to flare out because this will move the tension from the middle back to the rear delts and the traps. Try to start the positive phase (when you bring the weight up) by pulling with your shoulder blades first not with your arms. This will put the emphasis on your back muscles and will give you bigger stimulation on your back not on your arms. When you perform the movement think not for pulling the weight with your arms think for pushing back with your elbows and squeezing the shoulder blades together.